INDIANAPOLIS, Ind. 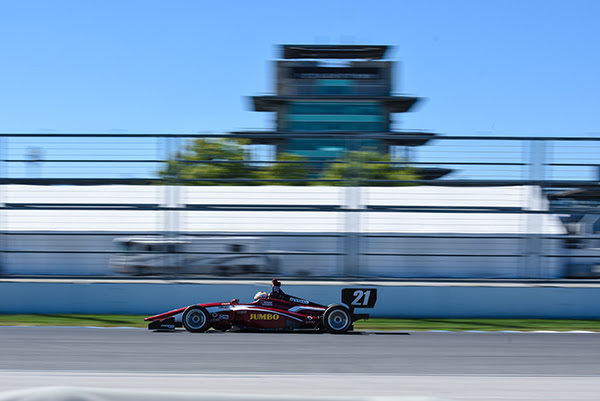 – After capturing the Pro Mazda Presented By Cooper Tires Championship just over three weeks ago, Rinus VeeKay had his first outing in the Soul Red Mazda Indy Lights machine at the eighth annual Chris Griffis Open Test at the Indianapolis Motor Speedway. The KNAF Talent First driver finished inside the top four in every session. The Pro Mazda Champion was delighted with his graduation to the Indy Lights car and was equally enthused by having the honor of representing the soul red colors of Mazda for the first time. VeeKay’s eyes are now firmly set on a strong winter testing program to be fully ready for the 2019 Indy Lights season.